Wake in your cozy beds and make your way to the dining table for a hearty breakfast to set you up for the day. Breakfast – Fresh baked French patisseries, fruits, cereals, Greek yoghurt with honey and toasted almonds, cereals, porridge, fruit juices, tea & coffee. 6 mornings you will be treated to a hot option such as scrambled egg & smoked salmon, American style beans on French bread, or soft boiled egg and soldiers. Get ready for the slopes and we will drive you to your lift of choice – Morzine, Avoriaz, Les Gets, or down the road to La Grande Terche. Hit the slopes and take in the beauty of the Portes Du Soleil. When you feel you have had enough for the day, give us a call and we will come and pick you up – grab yourself a hot chocolate or a vin chaud and we will be with you in a jiffy. Waiting at the chalet will be a homemade cake and a hot beverage – or a favourite tradition of ours, hot wings and a beer if you’re feeling adventurous! 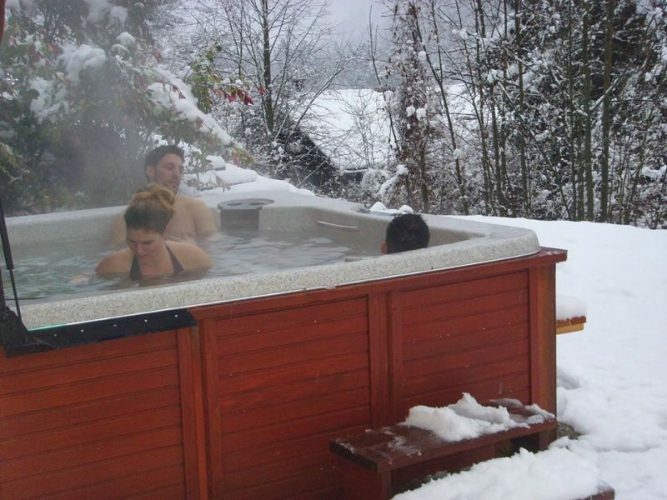 Take your time to settle in – you’ll have use of the sauna and the outdoor hot tub. We can also book you a massage to ease those ski muscles ready for the next day. Special occasion? Let us know and we can arrange a romantic bottle of champagne on the balcony or in the hot tub under the stars! Once you have relaxed take a drink by the fire with canapes and we will call you once dinner is ready. You will be served 5 courses with free flowing wine and beer throughout, taking your cheeseboard through to the lounge after dinner for your comfort. Happy and full – you will have access to books, board games and films plus the chalet has free wifi, and your comfy beds will be waiting for you when you are ready.